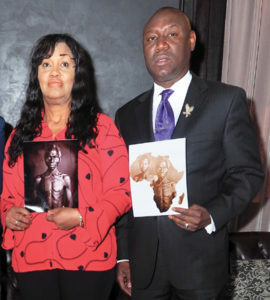 CAMBRIDGE, MA – A Connecticut woman today accused Harvard University of the wrongful seizure, possession and monetization of photographic images of her family’s patriarch, an enslaved African man named Renty, and his daughter, Delia. The images, believed to be the earliest known photographic images of slaves, were commissioned in 1850 by a Harvard professor, Louis Agassiz, and used to support a theory, known as polygenism, that Africans and African Americans are inferior to whites. Polygenism, widely advocated by the Harvard professor, was used to justify both the ongoing enslavement of Black people prior to the Civil War and their segregation afterward. As detailed in a lawsuit filed today, Harvard stood by its professor and, to this day, has never sufficiently repudiated Agassiz and his work. The lawsuit filed today in Middlesex County Superior Court alleges that Harvard has ignored Tamara Lanier’s repeated requests to stop licensing the pictures for the University’s profit and stop misrepresenting her great-great-great grandfather, the man she knows as Papa Renty. A direct linear descendent of Renty, Ms. Lanier is seeking return of the photos to her family, as well as damages from Harvard. The famed Harvard professor’s assertion of Black inferiority came at an opportune time for slave owners and northern profiteers from the cotton trade and aided their fight against abolitionists. The Fugitive Slave Act, widely seen as a barometer for the relative strength of the pro-slavery and abolitionist camps, was being hotly debated in Congress. For those seeking to prove that African Americans were inferior, Agassiz’s work, backed by Harvard’s prestige, was an invaluable gift. For decades, the images were then forgotten. In 1976, an employee of Harvard’s Peabody Museum, the late Ellie Reichlin, discovered them in a corner cabinet of the museum’s attic. Despite Ms. Reichlin’s expressed concern for the families of the men and women depicted, Harvard University chose to make no effort to locate the subjects’ descendants. In displaying and licensing the images, Harvard has avoided the fact that the daguerreotypes were part of a study, overseen by a Harvard professor, to demonstrate racial inferiority of Blacks. The lawsuit was filed in Middlesex County Superior Court. Sign the petition at https://www.change.org/p/family-to-harvard-freerenty.